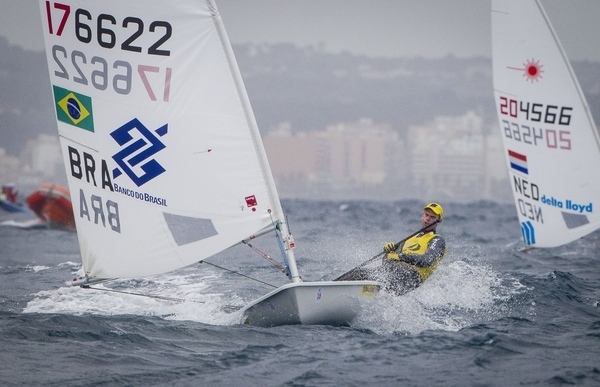 French Nacra 17 World Champion Billy Besson described racing at Trofeo Princesa Sofia - ISAF Sailing World Cup Mallorca like riding a rodeo bull as 20-25 knots meant the limits of sailors’ were tested. Southerly breeze whipping up wild winds and five metre swells pushed the nine fleets that got out racing to the max. 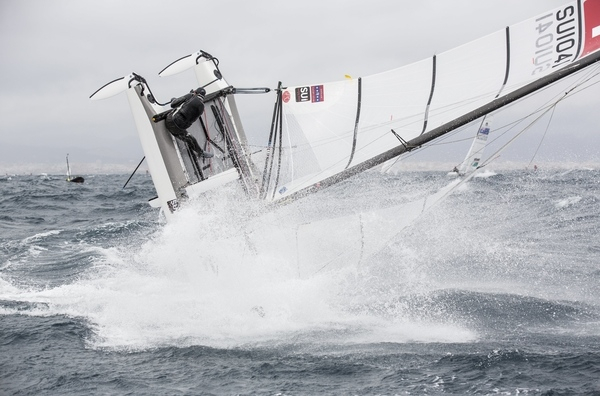 Fleets in the 2.4mR, 49er, 49erFX, Finn, Laser, Laser Radial, Nacra 17 and Men’s and Women’s RS:X got out racing with only the 470 fleets unable to hit the race course. 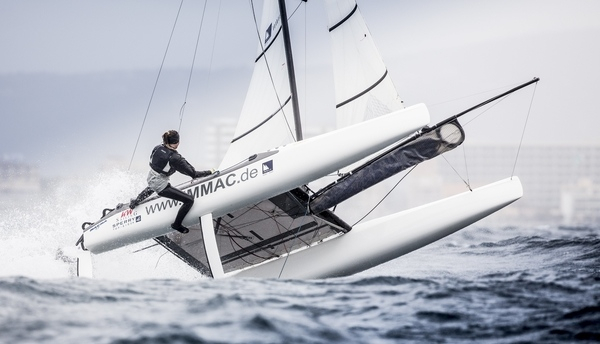 France’s Billy Besson described the racing like riding a rodeo bull as he and Marie Riou held on to the lead in the Nacra 17. 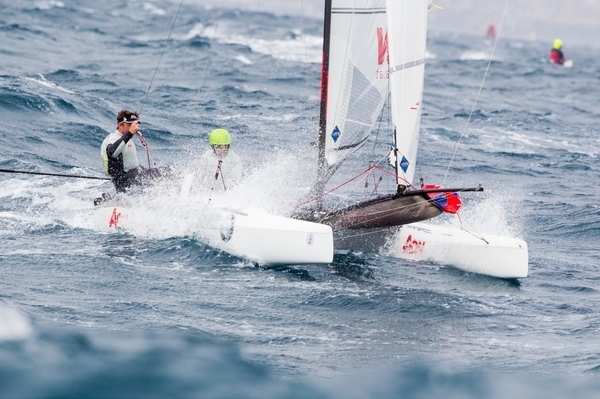 Besson and Riou finished third from the single Nacra 17 race and open up a 21 point gap at the top of the pack. After racing Besson said, “Keeping ourselves safe was our priority. It’s really difficult in the big breeze and it was like riding a rodeo bull because you just want to keep on the boat. Franck Cammas and Sophie de Turckheim (FRA) retain second on 39 points with Darren Bundock and Nina Curtis (AUS) a point behind. 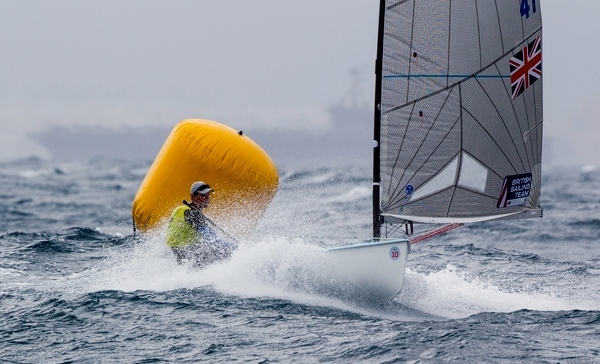 Bundock and Curtis won gold at ISAF Sailing World Cup Melbourne and are happy they’ve been tested in a range of conditions against the crème de la crème of the Nacra 17 crop. “Everyone who is campaigning for the Rio 2016 Olympics is here so it’s a good chance to check in where you are in your campaign. 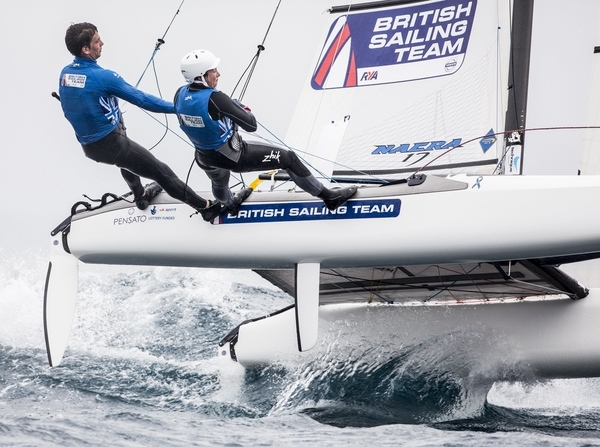 For us we’ve only just started, this is our third regatta and we’re pleased to be in third spot after such a short time in the class,” Bundock said. The day’s race win went to Vittorio Bissaro and Silvia Sicouri (ITA) who are fourth overall. The Laser fleet headed out onto the race course for an 11:00 am start expecting to be pushed to their limits. Scheidt finished 24th in the final race of the day and discards the result. 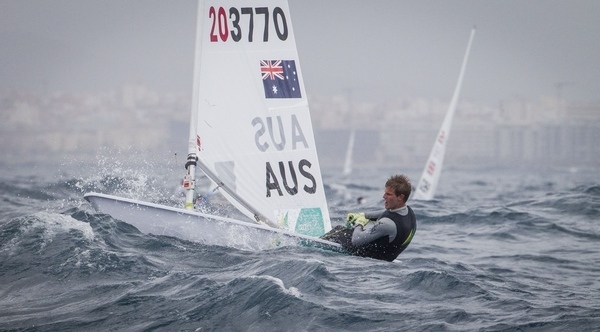 He has an eight point lead over Tom Burton (AUS) who enjoyed his best day on the water. 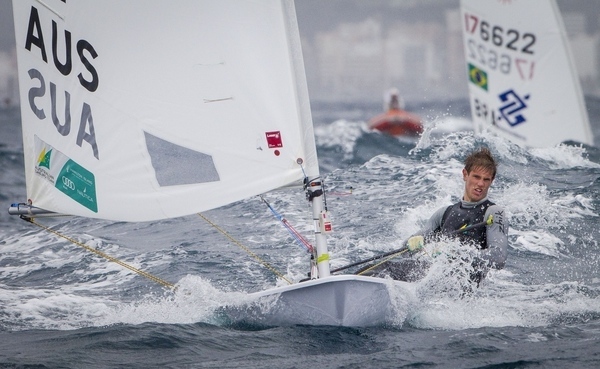 Germany’s Philipp Buhl also sailed well in the big breeze and is now third overall. 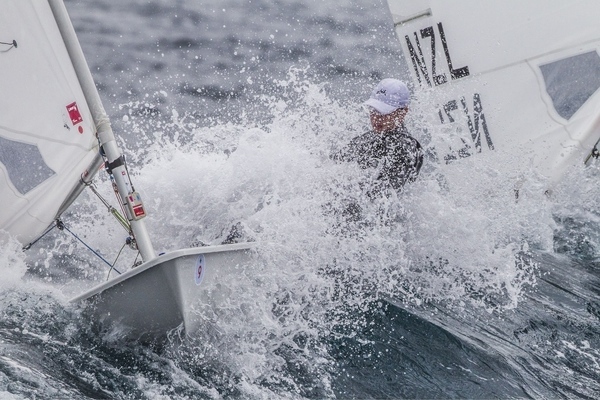 The day’s race wins went to Kontides (CYP), Andy Maloney (NZL) and Nick Thompson (GBR). Bouwmeester has only finished out of the top three once and in a range of conditions has demonstrated her versatility. 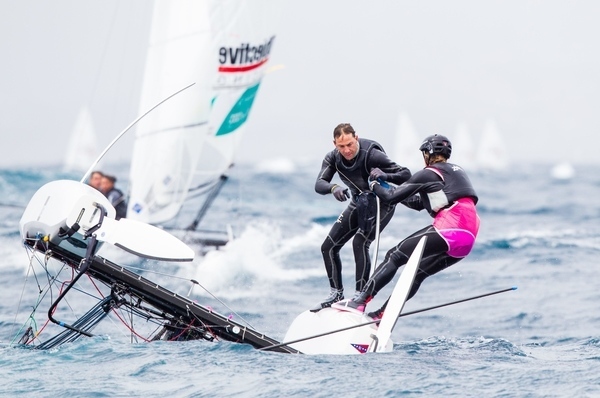 On her week so far Bouwmeester said, “We started off with light wind conditions and I was having a good regatta, I was not so sharp today but hopefully I can change that through the next few days. World number one Mathilde de Kerangat (FRA) took the final race win of the day. 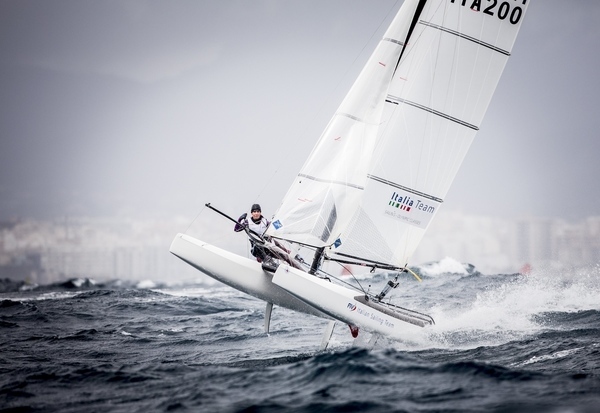 Byron Kokkalanis (GRE) overtook Pierre le Coq (FRA) in the Men’s RS:X following another steady day of racing. On being the leading French racer le Coq said, “It is a really important event. There are three French guys at the top so there is a big fight. Charline Picon (FRA) has opened up a 15 point lead in the 56 strong Women’s RS:X fleet as she revelled in the big breeze. The French racer opened up her day in fine form taking a bullet and backed it up with a second. An eighth in the final race gives Picon a healthy lead going into the penultimate day. Grael and Kunze lead on 22 points followed by the Danes on 25 points. Great Britain’s Charlotte Dobson and Sophie Ainsworth are third on 52 points. The Kiwis placed fifth in the opening race and won the second by just two seconds over Benjamin Bildstein and David Hussl (AUT). The Danes had an equally close race finish in the first race of the day and overcame Nico Delle-Karth and Nikolaus Resch (AUT) by six points. Despite not finishing the final race of the day Great Britain’s David Evans and Ed Powys remain on the podium with two days to spare. 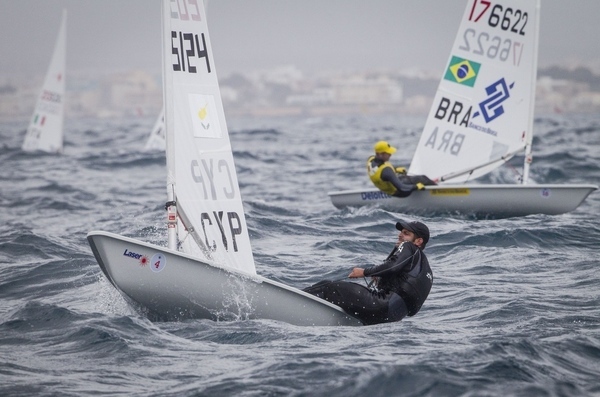 An eighth in the opening race was enough for them to go into the penultimate day with a two point advantage over Diego Botín and Pablo Turrado (ESP) in fourth. 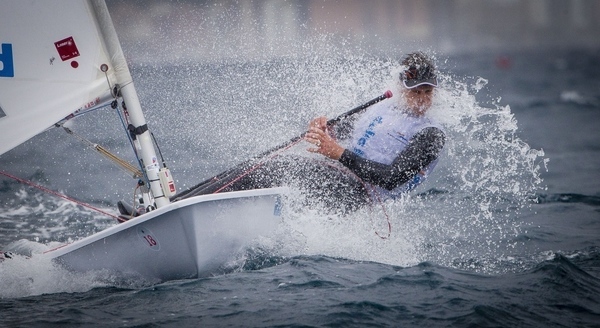 Giles Scott (GBR) solidified top spot in the Finn after he won both of the day’s races. 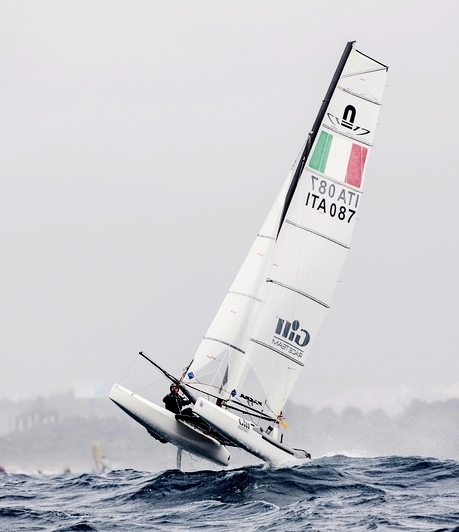 Scott was dominant in the strong breeze and is eight points clear of the week’s early leader Thomas Le Breton (FRA). Jonathan Lobert (FRA) trails his compatriot by 12 points in third. Megan Pascoe (GBR) brought Lucas’ winning run to an end in the fifth race as she came through to defeat her compatriot and take her first bullet of the week. However in the second Lucas was back on track and at the top of the pack. Heading into the final day of 2.4mR racing Lucas leads by five points and if she continues to display marvellous consistency then the gold will be hers. 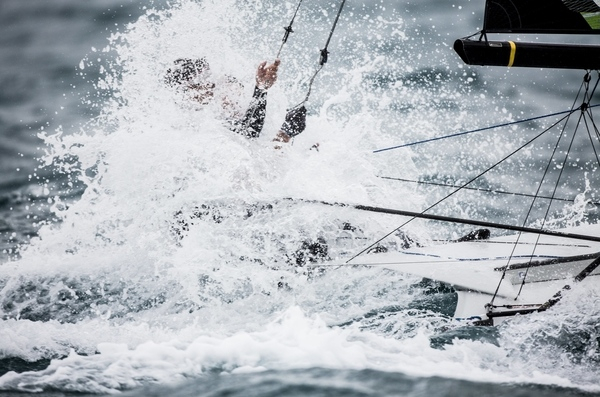 Due to increasingly strong winds no 470 racing was possible. The Women’s 470 will pick up Race 7 on 4 April whilst the Men’s 470 will start their eighth.